The Bartles & Jaymes or B&J original wine cooler first hit the marketplace in 1985. It has the traditional flavor of red wine accented with a citrus blend and a hint of apple. A 12 oz. bottle, the serving size of all of B&J's wine coolers, has 200 calories. Since that product launched in 1985, the company has churned out a number of other wine-flavored coolers. B&J cooler wine coolers come in four-packs. A new flavor to the B&J original wine cooler family is the Blue Hawaiian. With a blend of mango, papaya, pineapple and coconut, the Blue Hawaiian has 240 calories. Two other new offering are the Fuzzy Navel and the Mojito. The Fuzzy Nave, which has a mix of peach and orange flavors, has 250 calories. The B&J's Mojito, the company's version of the Cuban cocktail drink, features lime, mint and rum flavors and comes in at 260 calories. 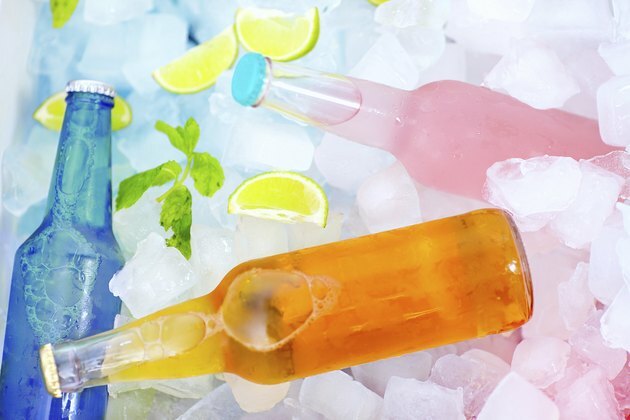 Several B&J's wine coolers are flavored with fruit. These include Exotic Berry, which has 220 calories; Kiwi Strawberry and Mango coolers with 230 calories; and Tropical Burst and Luscious Blackberry with 240 calories. Two B&J wine coolers have lemonade flavoring: Hard Lemonade and Raspberry Hard Lemonade, which have 230 and 240 calories per 12 oz. serving. A daiquiri-flavored B&J wine cooler, the Strawberry Daiquiri, has 230 calories. Twenty coolers offered by B&J are malt-based. In the 1990s, taxes on wine and drinks made with wines were raised and these drinks began to fall out of favor, according to columnist Matthew Latkiewicz at McSweeneys.net. "Bartles & Jaymes continued making wine coolers, but due to the increased expense, they switched out the wine with a cheaper malt beverage," he noted. "No wine was included, but brand trumps ingredients so we still refer to them as wine coolers."